The city of Ararat is on the Western Highway, 85 km west of Ballarat and 198 km north-west of Melbourne. Its name arose from a pastoralist/explorer, Horatio Wills, who arrived in the district in 1841 and named a rise ‘Mount Ararat’, for ‘like the arc, we rested there’. Mount Ararat (618 m) is about 7 km south-west of Ararat. The formation of Ararat as a township came about from the discovery of gold in 1856 and the Canton Lead in 1857. There was a rush of up to 15,000 people to the numerous rich alluvial gold sites and Chinese miners were numerous and held some of the richest sites. A township was formed, allotments sold in 1858 and a municipality was created on 24 September 1858. Anglican and Catholic schools were opened in 1857, and a Presbyterian church in 1859. By 1860 there was also a Presbyterian school, and most denominations had erected church buildings within a few years. A court house was built in 1859, a hospital was opened in 1860, and in 1860 the first of several major Government institutions in Ararat was opened – a gaol. A mental asylum was opened in 1865. Ararat’s role as a government railways centre emerged in the 1870s. 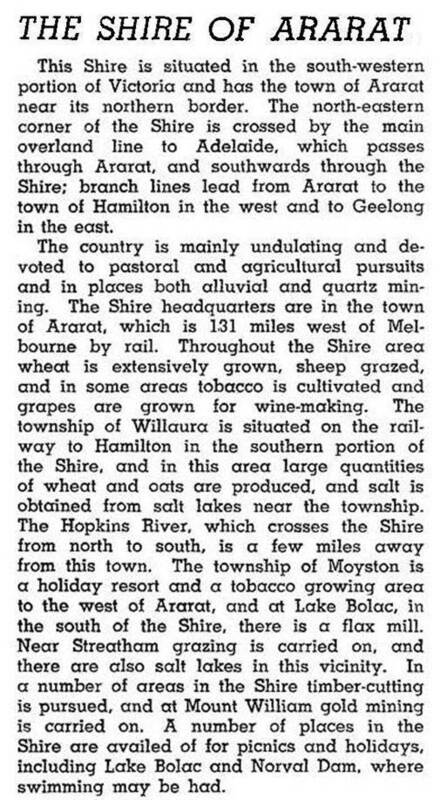 Bailliere’s Victorian gazetteer (1865) recorded that Ararat was surrounded by farms and squatting stations, and that new gold finds were continually occurring in the neighbourhood. Ararat was thus positioned in a mining and agricultural district, avoiding over-reliance on finite mineral reserves. The Ararat municipality was a borough, and the surrounding area was proclaimed Ararat shire on 8 March 1864. Both the borough and the shire erected halls and offices in the town, the shire building an eye-catching hall (1871) on part of what had been reserved as a market reserve. In time the former market square was also to be occupied by a town hall, a war memorial, a library and an art gallery. In 1875 the railway line was extended from Beaufort to Ararat, thus forming a rail link to Melbourne. Within a few years Ararat had a radial rail network to Stawell and Murtoa (1878) and Dunkeld and Hamilton (1877), positioning the town as a regional goods yard and locomotive engine maintenance site. A fourth line to Avoca and Maryborough was opened in 1890. By the 1890s Ararat had a population of over 3000 people. The once barren landscape around the gaol was being transformed into a botanic garden and Alexandra Park. A swampy receptacle for town wastes was later made into a lake. Reticulated water was brought from Langi Ghiran reservoir (1876) and Mount Cole (1883) in the Pyrenees area, although the supply was not made completely satisfactory until Lake Fyans in the Grampians was tapped in 1961. Difficulties with water supply may seem improbable when it is considered that several headwaters of the Hopkins River run through Ararat, and there is the large Green Hill Lake east of the town. The lake was in fact used as a storage, delivering a liquid described a ‘borough Bovril’ on at least one occasion. Shallowness was a problem. Denominational schools were replaced by a government school in 1865, and a Brigidine convent school was opened in 1890. Alexandra Park was completed in 1907 and the Alexandra sports ground was opened in 1920. Locomotive engine yards were developed and enlarged during 1914-29. A high school was opened in 1913. Ararat’s final input of government infrastructure came with a postal and telegraphic communications centre for the Western District in 1923. The shire’s area around Ararat contained numerous large pastoral estates at the turn of the century. Between 1900 and 1910, however, several were broken up into farms, and the Soldier Settlement Commission acquired about 80 square kilometres after World War I. Pastoral lands were found to be suited to wheat growing, particularly in the south of the shire around Willaura. In 1994 farming occupied 77% of the shire’s area of 3657 square kilometres, carrying 1,378,000 sheep and lambs and 25,900 meat cattle. Grain harvests comprised 20,813 tonnes of wheat and 15,642 tonnes of barley. Ararat town’s population was an ever increasing one during 1900-80. The role of government infrastructure has already been mentioned. Another factor was the decision in 1925 to route the Western Highway through Ararat instead of Hamilton, giving rise to motor garage facilities, an invigoration of accommodation facilities and the formation of passenger bus services. Prestige Hosiery opened a factory in 1943. The availability of housing became a problem, and the Housing Commission built nearly three hundred dwellings during 1947-60. Ararat went from a borough to a town (29 May 1934) to a city (24 May 1960). Upon achieving city status Ararat had 20 more years of growth before the population began to decline. The 1990s were particularly severe on population, as government bodies underwent destaffing; the Ararat gaol (J ward for the criminally insane) closed in 1991 and the asylum – Aradale – was decommissioned a few years later. Ararat has a fine array of historic sites and buildings. The court house, police station, the second hospital near the gaol (Pyrenees House) and the former gaol and asylum are registered buildings. Barkly Street is the address of the shire hall, the town hall, the Presbyterian church, the Catholic church and schools, the war memorial and four hotels. The Western Highway and railway line are one block northwards. In addition to Alexandra Park and its sporting facilities there are two golf courses, four other ovals, a sports stadium, a harness racing track/showground and a racecourse. There are four motels and two caravan parks. Ararat’s third hospital (1937) is next to the former gaol. The railway station has a tourist information centre. Attractions include the Gum San Chinese heritage centre, a regional gallery (1968) and a performing arts centre. Much of Ararat can be viewed from several hills around its amphitheatre setting. A popular viewing point is One Tree Hill, west of Ararat. The local newspaper is the Ararat Advertiser, founded in 1857 by Jabez Banfield. His son Edmund was the noted author of Confessions of a beachcomber and other north Queensland writings, and his granddaughter, Lorna, wrote several local histories. On 20 January 1995 Ararat city was united with Ararat shire and small parts of adjoining shires to form Ararat rural city (4230 square kilometres). The state government's Department of Primary Industry office in Ararat, that provided support and advice to the region's farmers, closed in 2012. Primary schools include Ararat North (65 pupils, 2014), Ararat (281 pupils, 2014), Ararat West (233 pupils, 2014); and the Ararat Secondary College (323 pupils, 2014).